We are an acclaimed Manufacturer, Supplier and Exporter of Holding Furnace based in Mumbai, Maharashtra. Our Holding Furnace is in high demand in the aluminum industry for its operation on foundry cast house and recycling methods. Our highly efficient Holding Furnace features quiet water cooled inductors for quick temperature reduction. Customers have the option to choose from a wide array of sizes. 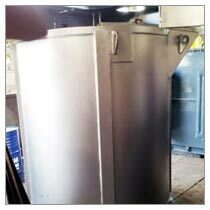 Buyers can get in touch with us for ordering our premier Holding Furnace at most affordable prices.